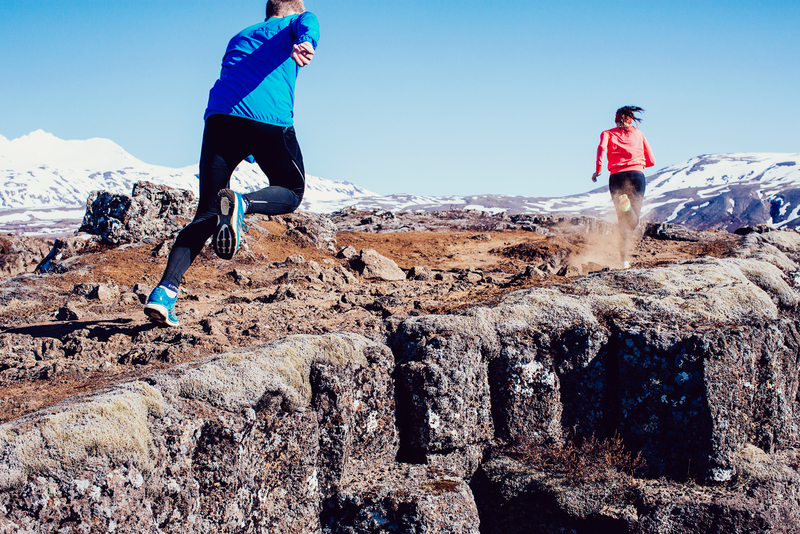 The idea came to us as we were running into the stunning valley of Thorsmork. It was the day of the Laugavegur Ultra Marathon. We had not taken part but instead were running the amazing Fimmvorduhals. It was so much fun, much more than we had imagined and so we thought, why not run the Laugavegur on our own as well? We would do the 55km trail in two days, taking it easy, just enjoying the trail and the beautiful ever changing scenery. Our only worry was whether it would be possible to get accommodation on this most popular hiking route in Iceland with such a short notice. We were so excited about this that first thing Monday morning we called the FI and as luck would have it, accommodation was available in the hut at Álftavatn close enough to the middle of the Laugavegur route. So here we were, on a Wednesday morning in the bus heading for Landmannalaugar, the start of the Laugavegur trail. The before we had taken two bags to the bus station and arranged for them to be sent to Álftavatn (“Swan Lake”). In those we had stuffed our sleeping bags, dry clothes and plenty of food. The bags were clearly marked with the destination „Alftavatn“ and the staff at BSI bus terminal assured us that the bags would end up there. However, they made it perfectly clear that no responsibility would be taken for them and that it was up to us to make sure there was someone at the other end to receive them, otherwise the bags might be sent back. We decided to ignore these words of warnings and trust the staff at the hut to know what to do with a couple of bags no one would claim. We weren’t too worried though, because the same plan had worked before when we sent bags to Básar in Thorsmork when running the Fimmvorduhals. Those who have hiked the Laugavegur trail or raced in the Ultra know that the distance from Landmannalaugar to Alftavatn is just over 21 km. This part of the trail involves a climb up to 1000m height to the hut in Hrafntinnusker and then a very steep downhill to our destination for the night. The weather was fine when we started, overcast but warm and still. We stopped almost every minute to take photos of the breathtaking views. Closer to the highest point in Hrafntinnusker it started to rain and visibility became very limited. Even in fairly good weather like we had, we sensed how easily things could go wrong as we could only see one marker at a time. In a little worse weather, it would have been easy to get lost. Making sure the weather forecast is good is therefore the most important part of the preparations. We were not fortunate enough to see the magnificent view down to Alftavatn as the rain would not stop. The weather was still excellent, warm and calm, but as we got closer to Alftavatn we were very wet. That’s when we started thinking, what will we do if the bags are not there? We are normally people who always plan every detail ahead, but this time we didn‘t really have any plan B. Our only conclusion was that we should have contacted the hut beforehand and let the staff know about our bags. It was therefore a great relief to meet the helpful hut staff who of course had realized that someone would arrive later for the bags and put them in a safe place. The day’s effort had taken us 3 and a half hours but we would probably have gone slower and stopped more if it had not rained so much. The lodge was excellent, very warm and cozy, with good cooking facilities and comfortable beds. However, we had trouble drying our clothes as everyone in the hut was hanging up their wet clothes in the same place. In the morning we arranged for our luggage to be sent back to Reykjavik. In our running backpack we packed dry clothes and extra food to eat on our way, as we expected to be around 5 hours on the trail and we had nothing waiting for us in Thorsmork(Thor’s woodland). We also had a belt with water, money, phone and other necessities. We had brought extra shirts and socks with us, but our running shoes and shorts were just about as wet when we put them on in the morning as they had been the night before. There are a few rivers that need to be crossed anyway so putting on wet shoes did not really matter and the shorts dried quickly once we started running. On the camping site in Alftavatn we counted between 60 and 70 tents. We did not meet too many people the day before but the second day was very different, perhaps because the weather was better. The rain had stopped and it was an absolutely perfect weather for running. We were the only runners on the trail and we could not understand why more people were not running. What better way could there possibly be to spend your summer vacation? We have both participated in the Laugavegur Ultra Marathon twice and thought that this was a very different experience. As we were not racing against the clock, we had plenty of time to admire the views, take pictures, stop and rest, wonder about the trail and admire the surroundings. We started running around 10 in the morning. We knew there was a bus leaving for Reykjavik at 4 pm from Húsadalur in Thorsmork, but we also knew there were others buses later in the evening. There was therefore no need to worry about the time, but as it happened we made it to the hut in Húsadalur Thorsmork around 3 pm. Just enough time to stretch, put on dry clothes and have a wonderful soup in the big hut at Húsadalur. The second day took us almost 5 hours, including plenty of stops for photos, food and fun! You can also read about our Fimmvörðuháls adventure, which was just as great and is possible to do straight after Laugavegur if you fancy 3 days on the run. Running clothes: Trail shoes, socks, shorts and longer running pants, short and long sleeved shirts. A buff and a packable running jacket. A belt for drinks, gels, phone/camera, money. A backpack with dry clothes to put on after the run on the second day. A watertight bag to store your clothes inside the backpack. Also food for a lunchbreak! Sleeping bag, hut shoes, a small towel, dry clothes, food to cook in the hut, snacks. Call ahead and make sure our bags would be in Alftavatn. We would have been pretty miserable in the hut with no dry clothes and no food! Finally, it is important to stress for those not too familiar with the route that it is not at all easy. Don’t go unless being used to long trail runs, study the route well, and most importantly make sure that weather conditions are very favorable.